When I came across this recipe the first words that jumped out from my computer screen was "super-moist". That really did it for me and I knew I had to try out this cake. I glanced at the recipe and it was really unusual! What makes this cake extremely moist was the use of thickened cream which is poured over the top just before the cake goes into the oven. I really could not imagine how it would look like but would it not result in a extremely soggy batter and an extended baking time? True to its name, this Apple Cake was extremely moist. The topping resembled soft cream cheese with a sugar crumble. It was extremely delicious and kept really well in the fridge even after 3 days. For different textures you may want to try baking it with a combination of apples, such as Granny Smith (which is quite tart), Macintosh (which is firm), and Cortland (which gets very soft with cooking). This recipe is definitely a keeper especially for the holidays. 1) Preheat the oven to 350°F (175°C). Grease and flour a 10-inch round, 2-inch-deep cake pan and line the bottom with parchment paper. Do not use a springform or loose-bottom cake pan. 2) In a large bowl beat 1 1/4 cups of the sugar and the butter for 3 to 5 minutes until light in color. Scrape the bowl as needed with a rubber spatula and continue to beat the mixture until it is very light in texture and color, several minutes more. 3) Beat in the eggs one at a time, scraping the bowl between additions. Then add in the vanilla extract and beat to incorporate together. 4) Sift together the flours, baking powder, and salt. Alternately add the milk and dry ingredients into the butter mixture, stopping to scrape the bowl as necessary. 5) Pour the batter into the prepared pan and spread it evenly with a rubber spatula. Arrange the apple slices overlapping in concentric circles on top of the cake batter to completely cover the top of the cake. Pour the cream evenly over the apples. 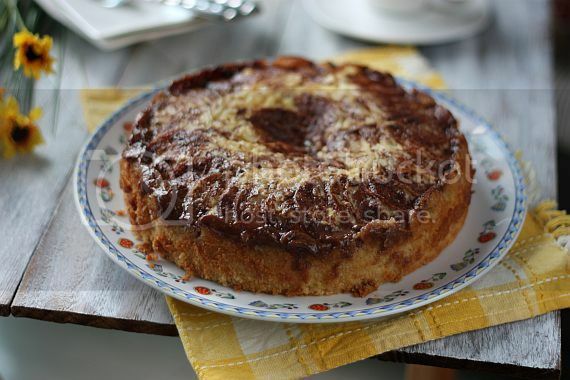 6) Stir together the 1/3 cup sugar, nutmeg and cinnamon and sprinkle the mixture over the top of the cake. Bake for 45 minutes or until a toothpick inserted in the center comes out clean. (I had to bake mine for close to 55 mins.) Remove the pan from the oven, transfer it to a rack, and let cool completely. 7) Invert the cake onto the rack, remove the parchment paper, and invert it once more onto a serving platter. Serve warm or room temperature. Once cool, the cake can be stored tightly covered in the refrigerator for up to 3 days. Wow wow... looks like a must-try for me!! I like the pix which shows lots of cinnamon powder! 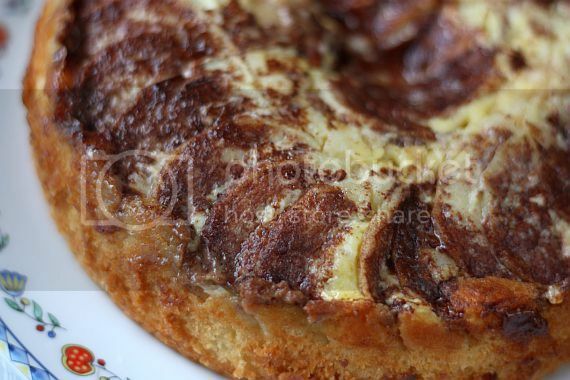 Looks delicious and a must-try cake. I must bake this one too! Love the caramelized apple topping! Oh, I do like this recipe. It should be delicious! I'm truly convinced! It just looks so good! Thanks for sharing, Jo! 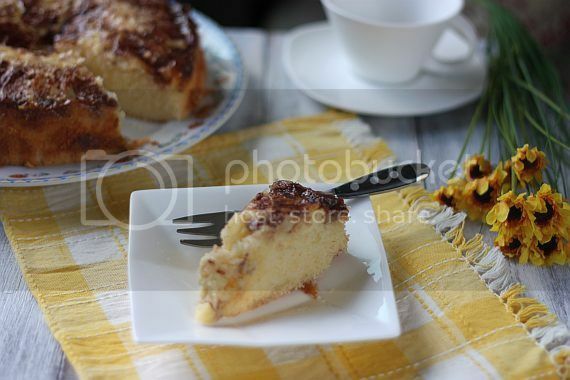 This apple cake looks beautiful and delicious! 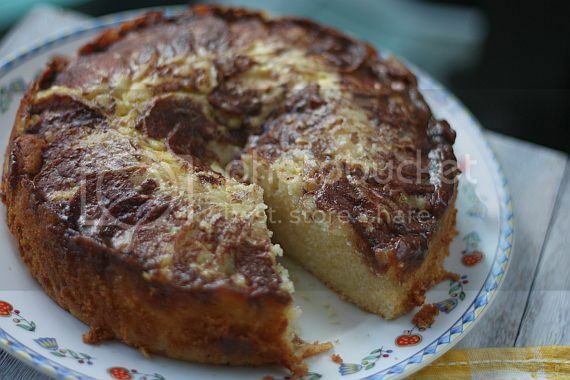 I haven't had apple cake for a while, I wish I could have a slice :)! can I just check with you about this point: Pour the batter into the prepared pan and spread it evenly with a rubber spatula. Arrange the apple slices overlapping in concentric circles on top of the cake batter to completely cover the top of the cake. Pour the cream evenly over the apples. Hi Yummy Bakes, no need to whip the cream. 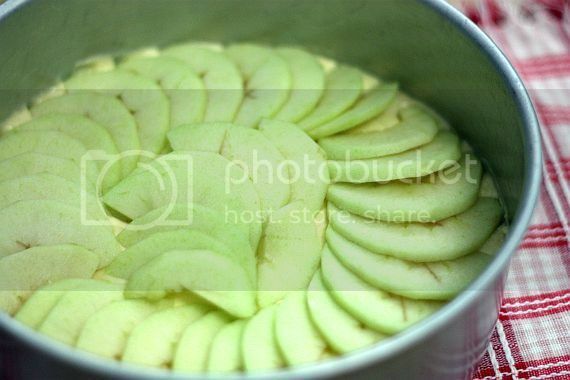 Simply pour it out from the container directly on top of the apples. Don't forget to sprinkle the cinnamon sugar after that. Happy baking!